SYDNEY, Australia, September 8, 2017 — ASUS today announced VivoMini VC68V, the world’s smallest PC that can house up to five internal storage devices and delivers uncompromising performance with a desktop-grade 7th Generation Intel® Core™ vPro™ processor. Featuring a versatile, modular design that enables three chassis-configuration options, users can easily create a system with the mix of solid-state drives (SSDs), hard drives (HDDs) and optical drives to suit their storage needs. VivoMini VC68V is the perfect conference-call hub with dedicated Skype® buttons on the front panel that enable users to start and end calls, and adjust volume instantly, and a built-in amplifier that provides clearer calls with wired headsets. VivoMini VC68V also supports ultra-detailed 4K UHD visuals on up to three displays via dual DisplayPort and HDMI output, and two front USB 3.1 Gen 2 Type-A and four USB 3.1 Gen 1 Type-A ports provide easy connectivity. As part of the ASUS Corporate Stable Model (CSM) program, VivoMini VC68V includes the ASUS Control Center IT-management software suite (CSM Edition, valued at USD$60.00) and a 36-month supply-availability guarantee. Powered by a desktop-grade 7th Generation Intel Core vPro processor (up to 4.2GHz) and up to 32GB DDR4 memory, VivoMini VC68V delivers uncompromising performance to run resource-intensive applications such as video editors or 3D-modeling software. VivoMini VC68V can be configured with optional Intel Optane™ memory for unmatched system performance. Intel Optane memory technology is a smart and adaptable system accelerator that improves responsiveness to enable up to 18X-faster HDD access speeds, 21%-faster daily computing performance and 1.5X-faster file searches. A high-capacity HDD, coupled with Intel Optane, provides the optimal combination of large storage and high-speed data access. VivoMini VC68V has a versatile chassis design with easily swappable modules that enable three different storage configurations: two 2.5-inch HDDs/SSDs, four 2.5-inch HDDs/SSDs, or two 2.5-inch HDDs/SSDs and one optical drive. VivoMini VC68V can also accommodate an additional M.2 SSD, for up to five total internal storage devices, giving users the flexibility to mix and match storage options to suit their needs. VivoMini VC68V features NVM Express® (NVMe®) support for blazingly fast SSD data transfers of up to 32Gbps. Additionally, RAID0 support enables up to 4X-faster data speeds with SSDs and HDDs, making VivoMini VC68V and ideal media server and video editing platform. RAID1 and RAID5 support also provides data resiliency for swift data recovery in the event of hard drive failure. VivoMini VC68V has a compact 2-liter chassis with an attractive, Zen-inspired spun-metal finish that fits perfectly in any office or workspace. Made to fit almost anywhere, VivoMini VC68V can be placed horizontally, vertically, and can even be attached to the back of a monitor or a wall with a VESA mount. VivoMini VC68V is incredibly energy efficient, drawing as little as 22W at idle. It also operates in remarkable silence, generating just 19 dB of noise at idle — quieter than a library. An easy-access slide-open chassis makes upgrading effortless. A barebones model is also available, allowing users to configure VivoMini VC68V with the operating system, memory, and storage options to meet their needs. VivoMini VC68V combines one-touch conferencing capability with powerful PC performance to facilitate collaboration for modern offices. Dedicated Skype buttons on the front of VivoMini VC68V enable users to start and end calls, and adjust volume instantly, and a built-in amplifier provides clearer calls with wired headsets. VivoMini VC68V also comes with Intel Unite™ for easier collaboration between onsite and remote participants, and more effective communication between teams across a wireless network. Meeting participants no longer need dongles or cables to connect their various devices, requiring just a PIN code to join the meeting. Intel Unite allows up to four online presenters to share their screens simultaneously, enabling side-by-side comparison of data from separate reports or documents, and collaborative presenting using different devices. All meeting participants can view, annotate and share documents in real time, and each participant can easily distribute content with the integrated file-transfer feature. Additionally, VivoMini VC68V features Intel® AC1200 Wi-Fi, Bluetooth® 4.2 for convenient connectivity, and a Kensington Lock slot for enhanced anti-theft protection. VivoMini PC VC68V is part of ASUS Corporate Stable Model (CSM), a program designed to provide businesses with a stable product supply and enhanced after-sales support. 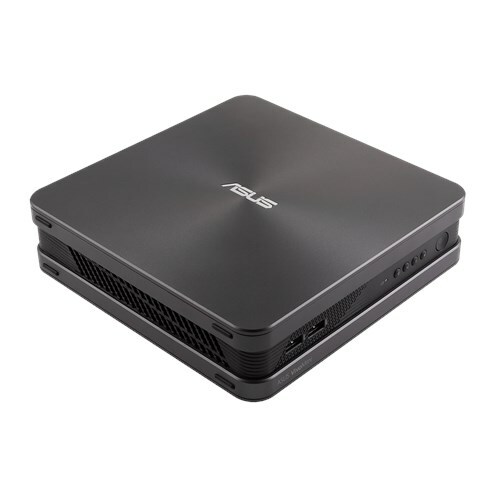 Each CSM mini PC purchase includes ASUS Control Center (CSM Edition, valued at USD$60.00) a server-grade IT management software suite that provides comprehensive control and monitoring. ASUS CSM products also include a stable roadmap and assured 36-month supply-availability guarantee to ensure customers will have no material-supply gaps. ASUS VivoMini VC68V will be available in ANZ for commercial projects only. Price varies with spec variations. Program offerings may vary by region. Please consult your local sales representative for more information. Starting from the product launch date.